There's one area of antique radio that I haven't seen discussed a lot and that is the subject of radio on postcards. You're undoubtedly familiar with the use of postcards to document Amateur radio contacts -- the common QSL card. However commercial AM radio stations, and even spark stations, have appeared on many postcards. This article will touch upon how radio stations have been portrayed on postcards, and how that portrayal has changed over the years. The very earliest stations were those operated by RCA, Marconi, other commercial interests, and the U.S. Government. See the stations from Cuba to Cape Cod pictured on the opposite page. These stations fascinated the public with their new technology and massive antennas and support structures. Postcards of these stations typically were black-and-white photographs, many of which are now nearing a century in age and which may have deteriorated somewhat. Little information is provided on the postcard other than the location of the station. The postcard captions in this article are an attempt to provide the historical context of the station or its current status. They are not intended as an exhaustive description of the station. As commercial radio stations "blossomed" during the late 1920s and early 1930s, the public was enthralled with this new medium of communication. What better means of bragging about the station in your hometown than to send a color postcard showing the station and its massive transmitting antennas to a friend in a less fortunate town. These early stations tended to be in downtown locations, typically with their antennas perched on the roof of a store, hotel or newspaper building. The early antenna technology utilized large flat-top arrays suspended between self-supporting towers. See examples in the postcards pictured on page 8. The postcards of this period almost always used a black-and-white picture that had been hand-colored before being reproduced. One gets the impression that the sun was always shining, and the sky was always bright blue near a radio station. These cards typically had a textured "linen" finish, and generally, contained little text. In this period, the flat-top antennas gave way to the vertical radiators that are used today. See the postcards on page 9. And the self-supporting antenna towers had largely been replaced by guyed towers. You will note another change -- the studios and transmitters have now been separated with dedicated transmitting sites located in suburban areas outside the cities. The hand colors on these cards are brighter than ever, and the architecture of some of the buildings has a decidedly Art Deco flavor. During this period, text more frequently appeared on the address side of the postcard. 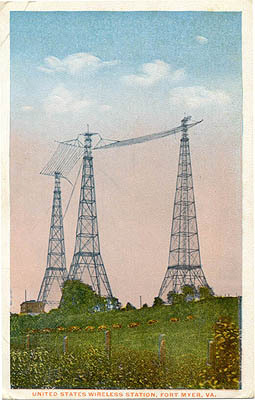 The text on earlier postcards tended to emphasize the "massive transmitting antenna" or the "world's tallest antenna." 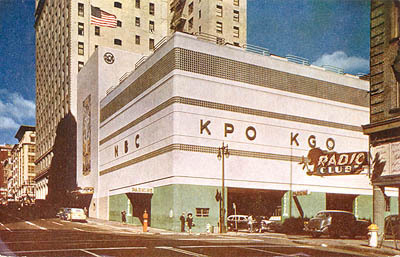 However, by this time the stations were more interested in emphasizing the variety and quality of their broadcasts, so the postcards now described "a five-story office building" or "five modern studios." Photos tended to be of studio buildings as opposed to antennas and transmitting sites. Examples appear on page 10. Postcards advertising specific radio stations became less and less common during this timeframe, although there are a few interesting examples. Stations switched to other promotional methods, and much of the advertising now emphasizes specific radio shows, performers or formats (talk radio, classic rock, all news, etc.) as opposed to promoting the station itself. If you'd like to collect a few radio postcards, it isn't difficult. You may come by these postcards in a number of ways -- although I'll have to admit that I haven't seen many even at the big Antique Wireless Association Conference and Auction in Rochester, New York. Logging on to eBay and searching for "radio postcards" will generally turn up a few for sale. Other than eBay there are a number of Internet sites offering postcards to collectors. A careful watch of your local newspaper may turn up postcard sales, either as stand-alone events or as part of an antiques show. Most postcards aren't dated, but there are a few things that you can do to get an idea of the age of the postcard. If the postcard has been used by your Aunt Minnie, the postmark date will help. You can also get a rough idea by comparing the subject and layout of the postcard to the examples shown with this article. Here are several guidelines that may also help. -- Postcards that have the front texturized to look like linen, were generally printed between 1930 and 1944. Quite often, these were black and white pictures that had been hand-colored. -- Postcards with true color photographs and a glossy finish began to appear about 1945. -- As mentioned earlier, pre-1930 stations used antennas in downtown locations, quite often on the tops of buildings. 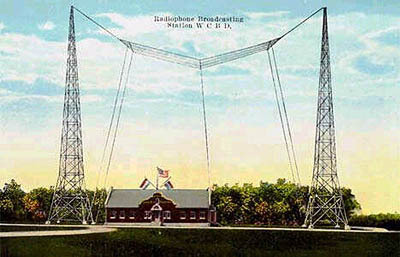 If the postcard shows a country location for the transmitter and antenna, it more than likely dates from 1930 or later. -- If a transmitting antenna is shown, look at its design. 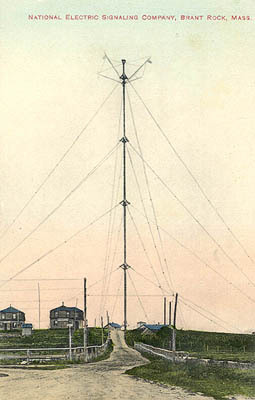 Most stations used flat-top, self-supporting antennas until about 1930. After that, the preferred antenna was the guyed vertical which gave reduced skywave coverage during the nighttime, but better groundwave coverage during the daytime hours. -- If cars are present in the photo, a keen eye may be able to discern the model year. -- The Curt Teich firm, a major printer of postcards, used a numbering system with one or two digits and a character, followed by a serial number. The digits refer to the year the card was printed, and the character to the decade (A=1930s, B=1940s, C=1950s, etc.). Thus, a Curt Teich card with the number "5A-H2206" was printed in 1935. -- You might be surprised at the amount of historical information that's available on the Internet. A quick AltaVista search turned up information on four of the five stations shown in the postcards from the 1900-1925 period. Whether or not you decide to collect radio postcards, you'll almost certainly run across one at some time or another. When you do, take a minute to reflect on how the lowly postcard has chronicled the evolution of AM broadcasting in the U.S. Interested in radio and its history since his high school days in the 1950s, Steve Auyer collects a "little bit of everything" and is active in Amateur radio in the Syracuse, New York, area. A member of the AWA and several local clubs, he is a Radio Merit Badge counselor, and he was instrumental in getting a permanent Amateur radio exhibit at the local science museum. 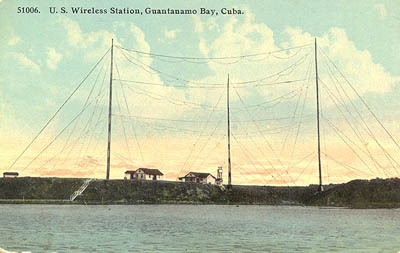 "U. S. Wireless Station, Guantanamo Bay, Cuba." From the Navy's history of Guantanamo Bay: "Along the north boundary line a 10-foot high concrete wall was built, extending across North Toro from Wireless Inlet to Granadillo Bay. The wall was completed in 1906. The first wireless (radio) station was also constructed in Commander Rogers' time (1905), the location being on a northwest peninsula of North Toro Cay, the peninsula now named Wireless Point." 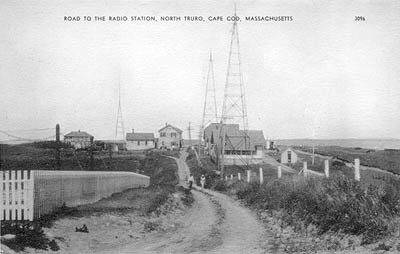 "Road to the Radio Station, North Truro, Cape Cod, Massachusetts." A Naval radio station for intelligence monitoring was established at Highland Light in 1904. The station assumed great importance during World War I and was guarded by a detachment of Marines. The site was used for a Coast Guard radio traffic facility from 1939 to 1943. It no longer exists, but the lighthouse, now renamed "Cape Cod Light," remains. 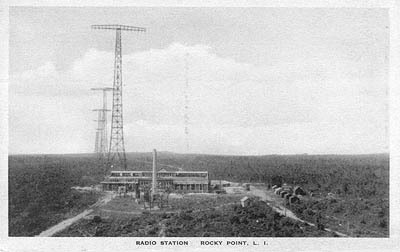 "Radio Station, Rocky Point, L.I." This is RCA's "Radio Central" which went on the air on November 5, 1921, as the Riverhead Facility. The antenna towers were 412 feet high with 150 feet cross arms. The last tower was demolished on December 13, 1977. "National Electric Signaling Company, Brant Rock, Mass." In 1902, two Pittsburgh millionaires founded the National Electric Signaling Company (NESCO). In 1904 NESCO tried to directly compete with Marconi, by setting up a transatlantic radiotelegraph service, operating between Brant Rock, Massachusetts and Machrihanish, Scotland. But, while still developing the link, the transatlantic effort abruptly ended in December, 1906, when the Machrihanish antenna collapsed in a storm. "United States Wireless Station, Fort Myer, VA." The United States Naval Radio Station was situated at the southwestern end of the Fort Myer Military Reservation opposite Washington, D.C. Built by the United States Navy Department on land ceded to the Navy Department by the War Department, the station's rated power was 100 kilowatts. Normal range day 2,000 miles, night 3,000 miles. One tower, 600 feet high and 150 feet square at its base, and two towers, 450 feet high and 120 feet square at each base, are positioned in a triangle. The largest tower is at the apex, and the distance between the towers is 350 feet. "W.O.C. Broadcasting Station, Davenport, Iowa." WOC continues to operate in Davenport, Iowa, on a frequency of 1420 kHz at a power level of 5,000 watts. 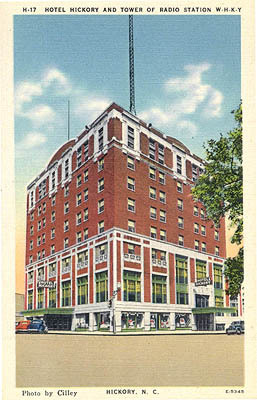 "Hotel Hickory and Tower of Radio Station W-H-K-Y." WHKY continues to operate as a daytime radio station in Hickory, North Carolina, on a frequency of 1290 kHz with a power level of 5,000 watts. The antenna has been moved to a hill southeast of the center of town. 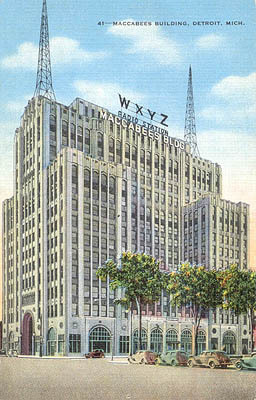 "Maccabees Building, Detroit, Mich." WXYZ is no longer in the FCC AM station database. The Royal Maccabees Insurance Company has been acquired by another firm. I have also seen postcards of this building with one and three towers on the roof, so don't take everything you see on a postcard as "gospel." "Radiophone Broadcasting Station WCBD." 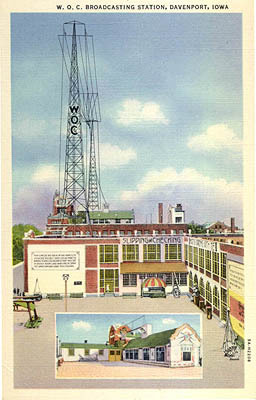 In the 1930s, WCBD was a radio station in Zion, Illinois. WCBD-TV now operates on Channel 2 in Charleston, South Carolina. The call sign is no longer in the FCC AM database. 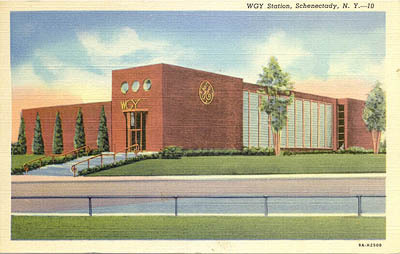 "WGY Station, Schenectady, N. Y." WGY continues to operate in Schenectady, New York, on a frequency of 810 kHz at a power level of 50,000 watts. 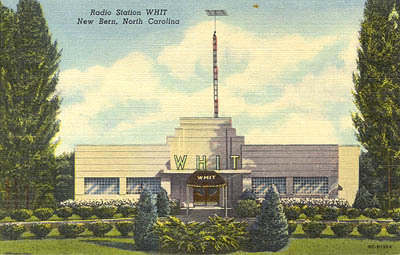 "Radio Station WHIT, New Bern, North Carolina. RADIO STATION WHIT, Where Hospitality is Traditional." This was the first broadcasting station in Craven County. Established in1942, it is located one mile south of New Bern on U. S. Highway 17. WHIT continues to operate as a daytime radio station on a frequency of 1550 kHz at a power level of 5,000 watts. 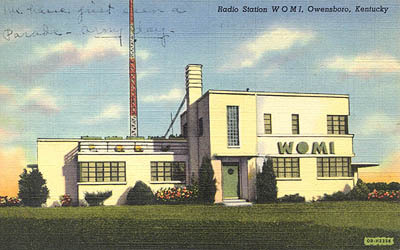 "Radio Station WOMI, Owensboro, Kentucky." WOMI continues to operate in Owensboro, Kentucky, as a 24-hour station operating at a power level of 830 watts. "Montana's Model Station. KPRK-Livingston-1340 KCS." 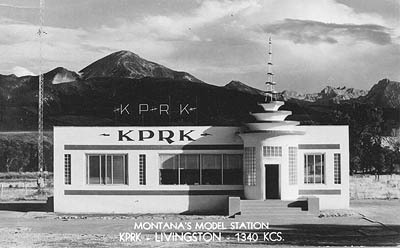 KPRK continues to operate 24 hours a day in Livingston, Montana, on a frequency of 1340 kHz with a power level of 1,000 watts. 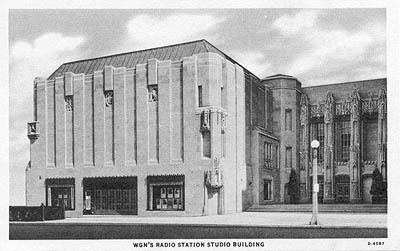 "W-G-N's Radio Station Studio Building," 441-445 North Michigan Ave., Chicago, is the only building in the Middle West devoted exclusively to radio broadcasting. There are seven broadcasting studios located in the building, as well as offices, artist's rooms, control rooms, and workshops. WGN continues to operate on a frequency of 720 kHz with a power level of 50,000 watts. "Las Vegas Looks Up to KFUN. Radio Station KFUN. Las Vegas. New Mexico. Best Small Town Station in the Nation." Operating full time on 1230 kilocycles with 250 watts of power,its first Broadcast was Christmas Day 1941. An unusual ground condition results in a daytime effectiveness equal to 1,000 watts! The adobe building is situated a half mile from the original Santa Fe Trail, and the tower is 200 feet high. 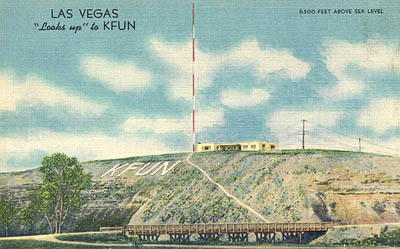 At an elevation of 6,500 feet, KFUN is one of the highest radio stations in the United States. KFUN still operate on 1230 kHz but now at a power level of 1,000 watts. 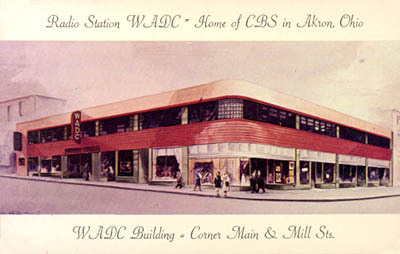 "Radio Station WADC = Home of CBS in Akron, Ohio. WADC Building = Corner Main & Mill Sts. The WADC Building was completed May 6th, 1949. The entire second floor is occupied by WADC, which was established April 8th, 1925, and is owned and operated by Allen T. Simmons." 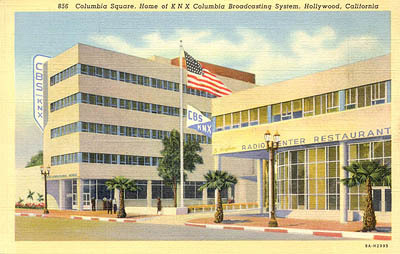 "Columbia Square, Home of KNX Columbia Broadcasting System, Hollywood, California." The building now stands on the spot where the motion picture industry first took root in Hollywood in October of 1911. Located on Sunset Boulevard, it is a 5-story office building with eight studios, the Playhouse, and adjoining offices for the Columbia Management of California. KNX continues to operate on a frequency of 1070 kHz with a power level of 50,000 watts. San Francisco Radio City. A million dollar modern streamlined and air conditioned building, literally the most perfect broadcasting plant devised by the hands of Radio Industry's miracle engineers, making possible more programs, better production and quicker news dissemination. Today KGO operates on a frequency of 810 kHz with a power level of 50,000 watts. 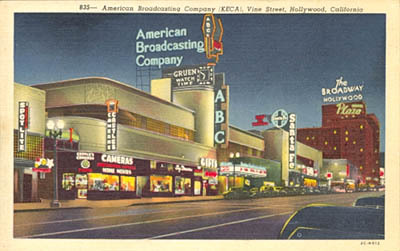 "American Broadcasting company (KECA), Vine Street, Hollywood, California. On this famous thoroughfare in the heart of glamorous Hollywood, are located the Pacific Coast headquarters of three of the major networks, broadcasting and televising coast to coast, affording daily entertainment and pleasure to thousands of visitors to Hollywood." Last revised: April 22, 2001.